Unfortunately, headaches and other symptoms of TMJ disorder (TMD) are often misdiagnosed as issues that are more difficult to treat. TMD occurs when the TMJ, or temporomandibular joint, becomes inflamed. Causes for TMD include teeth grinding, physical trauma, or other inflammatory diseases. More than 10 million Americans are suffering from these miserable symptoms of TMJ disorder. Fortunately for our patients, Dr. Hull and Dr. Stewart recognize a case of TMD when they see it. Both doctors have had training through the Kois Center, a recognized dental association that is committed to the best in dental education. Dr. Hull and Dr. Stewart offer excellent TMD/TMJ treatment so that you can find relief from headaches and other symptoms and get back to your comfortable life. The TMJ treatment we use includes deprogrammers, bite splints, and NTI appliances. After you come in for a consultation, we can design a treatment program that is right for you. Deprogrammers eliminate muscle-related TMJ pain by rewiring the way your body applies force to your anterior teeth. When less force is used, your muscles will be less strained and more relaxed. 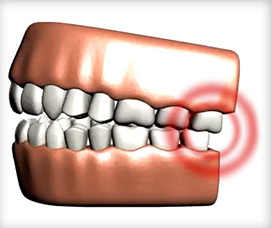 Another TMJ treatment our doctors offer is a bite splint. This bite splint is custom-made for your jaw, and it prevents you from clenching or grinding your teeth. This, too, will relax your joints and muscles and give you relief. Finally, we offer NTI appliances, an oral appliance similar to a splint that works to specifically reduce the tension caused by teeth grinding during sleep. NTI appliances will prevent headaches and migraines by suppressing this tension. Have any questions about TMJ /TMD treatment options we offer for headaches at Stewart & Hull Aesthetic & General Dentistry in Comstock Park? Stop letting TMD drag you down. Come see our doctors to see what we can do to eliminate your discomfort with TMJ therapy. Contact us today if you are in the area, including Grand Rapids and Rockford, MI.